As a teenager, I acted responsibly, and drove a responsible car - a pretty but economical six cylinder Falcon. The cars I really lusted after were the small MOPARs, and it never changed. I remember the first Formula S I ever saw - maroon with a gold stripe, four speed, fast. Justifiable as a cheaper hobby than fishing or hunting, and relatively practical since I drive one of the A-bodies to work every day, my wife accepted it and now works on the cars with me. I've tried to keep variety down so all I learn works on any car. I started with the 67 A-bodies, but couldn't resist the first generation Barracudas. While we were stationed near Seattle, the first was a 66 Formula S, advertised on the Internet for cheap. I actually bought the car based on the value of some of the parts. Though rusty, and a veteran of many eight tracks and gauge clusters (filled over 30 screw holes in the dash! ), shag carpet, dingle-berries over the windshield, and fake fur dash, I could see a shiny new S underneath. It should probably be a donor car. The car had a late June build date, still had the 8 ¾ with 3.23 SG, disk brakes, and some of the Commando engine trim. Under Rustoleum primer, hints of Citron Gold Poly remained, and the rear seat was still Citron Gold. The buckets now sport a school bus seat blue vinyl. Remarkably, the 150 speedo and tachometer were still intact. The engine was a 360 4bbl, but the carb adapter left no room for an air cleaner, so I didn't have much faith in it. It did make the hour-long trip home uneventfully. I began to disassemble, with expectations of a year long project. Two years later, I piled the parts inside and towed it to my parents' home in northern Mississippi, through a blizzard in the northwestern states. It has to get better! 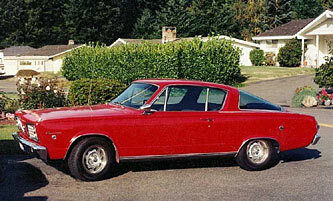 The second 66 was also a Formula S. It was also showed on an Internet search - but on a small car lot near Seattle. Cathy and I drove up to take a look, and were pleased. It seemed fairly priced, and the owner seemed to appreciate his cars. It was sitting near one of the other 10 or so cars on the small lot - a 66 Hemi Coronet! This car was no creme-puff, but seemed ready to drive without extensive work. My daughter Catie drove it her senior year in high school. She liked the manual fast ratio steering - it kept her arms "buff." The previous owner didn't do things as I would, but what he had done was done well. Very high quality dual exhaust, new springs, new brakes, new windshield, new paint. Unfortunately, it looks like the MAACO taxi special up close, red over the original white. The most recent is a very worn but original Citron 66, bought for Citron interior parts for the project S, and for reference. I put the unknown 360 from the project car in it and drove it from Seattle to Virginia without any trouble. Even worn and faded, people smile, wave, or start talking about one they remember from earlier days. Old guys stop and talk in the interstate rest areas, or at the gas pump. There may be three early Mustangs there, but there won't be another Barracuda. In these cars, you don't need neon wheelwell lights to be different. A half day in a junkyard may result in one long lugnut, or one radio knob, but you go home feeling successful. If the red Barracuda stays red, I just need to find the Blue Fish. Michael Mann currently lives in Mississippi, with his wife Cathy.